Play GAME OF CHOICES II career test and career game, start by taking the career quiz, identifying your hidden talents, in what careers you are most likely to succeed, and if starting your own business is the way to go. If you find yourself needing assistance, you have your own personal mentor available to you. If you would like more in-depth support, click offers and receive live chat coaching or one-on-one training. This is a fun career test app that anyone can play! This fun career game is an excellent way to have fun with friends and family. The different career choices and situations provide an opportunity to dialogue, create interesting conversations about life, politics and the world we live in. Install the Apple Watch Extension and enjoy positive daily messages to your Apple Watch. Respond to each reminder and the app will respond to you with a quick reinforcement to live each day knowing that your actions can change the world! The daily messages remind you to live each day with purpose and a growth mindset. 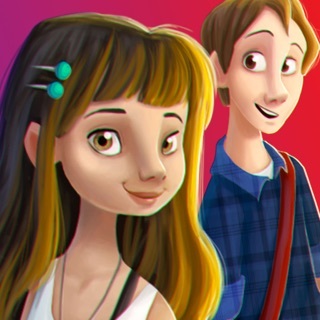 What makes GAME OF CHOICES™ II “The career coach, life mentor, success guru & career test app” unique is its entertaining take on real-life scenarios and critical decisions, all wrapped into a fun to play word game. Find out more about a career you always wondered about simply by choosing one of the career choices offered. Do you have what it takes to make it in the career of your dreams? Develop a winning mindset for whatever career path you choose! Play GAME OF CHOICES II the ultimate career test and find out hidden talents! Test your aptitude in a variety of realistic scenarios and life curveball questions tailored to the career of your choosing. Stuck? Access your mentor for advice. Experts say that the best leaders know how to make quick decisions based on limited data. Practice making good decisions with the help of a pro and get rewarded for the choices that lead to success. Decision making is more than a series of choices but rather learning what you value and making decisions based on those social values. GAME OF CHOICES II allows you to choose social values that you find important and based on what you value you have scored accordingly and given wisdom points, which you can spend on products, unlocking game features, and accessing the mentor. Don't let the comic strip look fool you. 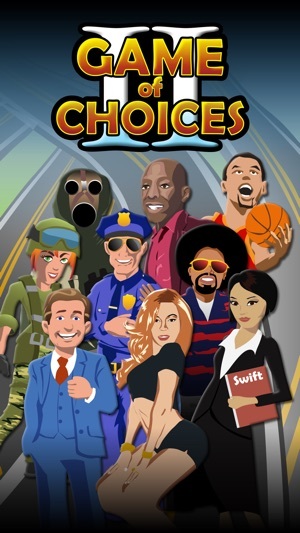 GAME OF CHOICES II will make you think, and may even make you mad! Career choices can be difficult, but playing a game that allows you to take a career personality test, or simply a career quiz, is fun! On top of that, you can then play the career that lines up with your results and see how you score! 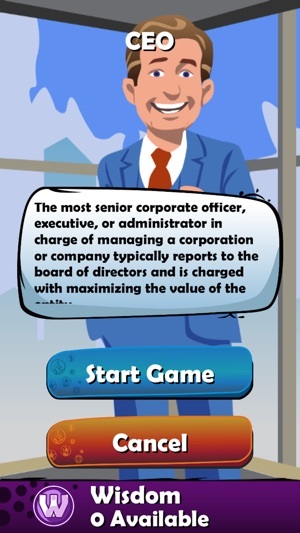 While playing GAME OF CHOICES™ II is entertaining, it can also be used as a preliminary employment test career assessment to develop a career plan. Psychometric testing is an important part of the hiring process. Play GAME OF CHOICES™ II and test not only your aptitude but your mindset for the specific field you are choosing. 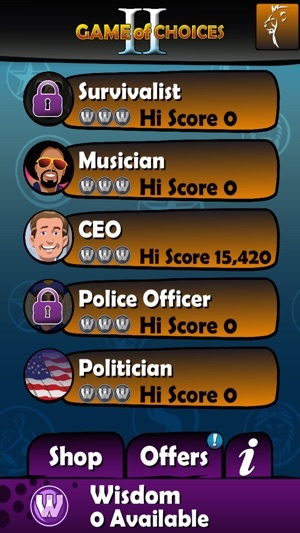 One of the most intriguing features of GAME OF CHOICES™ II is the mentor or life coach option. As you play each career you are faced with different life scenarios, and if you find yourself stuck or needing assistance you can just click the mentor life coach option in the upper right-hand corner of each career question. Your mentor is always there to provide guidance and wisdom. 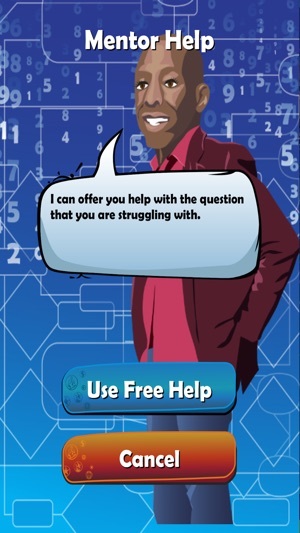 Play GAME OF CHOICES™ II and reap the benefit of having your own personal life coach. GAME OF CHOICES™ II is the ultimate career test! The GAME OF CHOICES™ II app helps you build a winning strategy for life. Take the ultimate career test and see if you have what it takes to survive in this complex world. If you enjoy word and trivia games this is for you! Biased, uber liberal, and racist. This isn't a game of choice, it's a game of "think like the developers". It's the liberal idea of think like me or you're wrong played out in multiple choice questions and answers. Things like: Sometimes you have support something you you don't like, to get what you want in the political game question. The only answer that doesn't give you HUGE negative points is support Obamacare and deny abortion. Seriously??? Not everyone thinks like that. A great app, help me increase social way with colleagues, superiors. The app has a lot of questions of conduct, I am sure many of you can hardly decent answer. Thank developers, hope more updates with many situations questions futher!!!! I know some users have complained that the game is biased, but I think that’s what makes it so intriguing and fun to play. The real word IS biased and racist... the question is, can you figure out how to navigate it successfully? 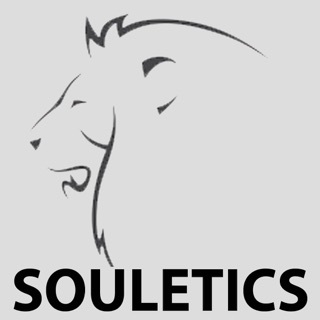 Souletics "The Healthy Living and Life Motivation, Wisdom App"